Bridgestone e7 has the firmest compression of all the e Series golf balls – around 75. This gives it a lower trajectory than the lower compression e5 and e6 balls. When placing ball in hand, the Dual-Dimple pattern surfacing becomes very noticeable. It's a little different but you'll quickly get over it. 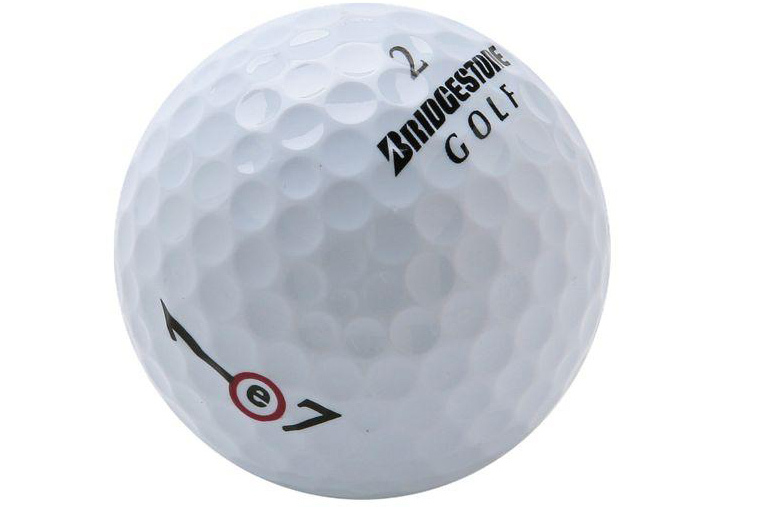 The printing and paint of this classy Bridgestone ball looks top-notch. e7 has 4% shallower dimples than the previous model to push the flight higher. A ball designed for those who want distance, the e7 couldn’t be further away from the e6 off the tee. It feels so much harder. However, I wouldn’t say it's an unpleasant feeling and if you like a harder-feeling ball you’ll love this offering. But like the e6, the e7 has a surlyn cover, and consequently I find it doesn’t spin as much on wedge shots. Less driver spin and wedge spin than the e6. Longer off the tee than the e6 due to the lower trajectory and additional roll. Solid check around the greens for a firm ball, as too, good pace on long putts. Golfers with swing speeds around 100mph, who hit the ball fairly straight, will get more distance with their driver with the e7 because of its firmer core - a ball that was tweaked to be firmer than the 2011 version.